As mentioned earlier, the current TDA tools (Samurai/TDA) don’t mine the data inside thread dumps or provide a more detailed view of what each thread is doing while just limiting themselves to reporting the state (locked/waiting/running) or the lock information. No mention of type of activity within a thread, should it be treated as normal or deserving a closer look? Can a pattern or anti-pattern be applied against them? Any possible optimizations? Are there any hot spots? Any classification of threads based on their execution cycles? In collaboration with Oracle A-team colleague, Eric Gross, the author decided to enhance the existing open source TDA version 2.2 instead of reinventing the wheel and leveraging the capabilities of base TDA to handle base parsing of the thread dump, the UI and Reporting. Eric Gross enhanced the TDA to fully support Sun Hotspot, JRockit (support was partial for JRockit in base TDA v2.2) and IBM JVM Thread dumps as well as adding support for custom categories in the TDA tool. Sabha Parameswaran enhanced the tool’s analytics capabilities – grouping of threads based on functionality and tagging of threads with advisories using pre-defined rules and patterns which can be extended to handle additional patterns. The health levels (in descending of severity) are FATAL (meant for Deadlocks, STUCK, Finalizer blocked etc), WARNING, WATCH (worth watching), NORMAL and IGNORE. Based on the highest criticality of threads within a group, that health level gets promoted to the Thread Group’s health level and same is repeated at the thread dump level. There can be multiple advisories tagged to a Thread, Thread Group and Thread Dump. One can see the thread groups are divided into two buckets – WLS and non-WLS related threads. The JVM threads, Coherence, LDAP and other unknown custom threads go under the non-WLS bucket while all the WLS, Muxer, Oracle, SOA, JMS, Oracle Adapter threads are all under the WLS bucket. •UnsyncCircularQueue$FullQueueException: Queue exceeded maximum capacity of: ‘65536’ elements. The FullQueueException essentially indicated that the WLS’s internal request queue was getting overwhelmed with requests and its starting to ignore/drop new requests as its already has 64K requests waiting to be executed. These requests can be internal (like transaction timeouts, schedulers, async processing) or externally generated (like client http requests). The storm of requests coupled with p13n being a key presence for the issue indicated p13n cache is triggering an internal flood of requests to the server somehow. 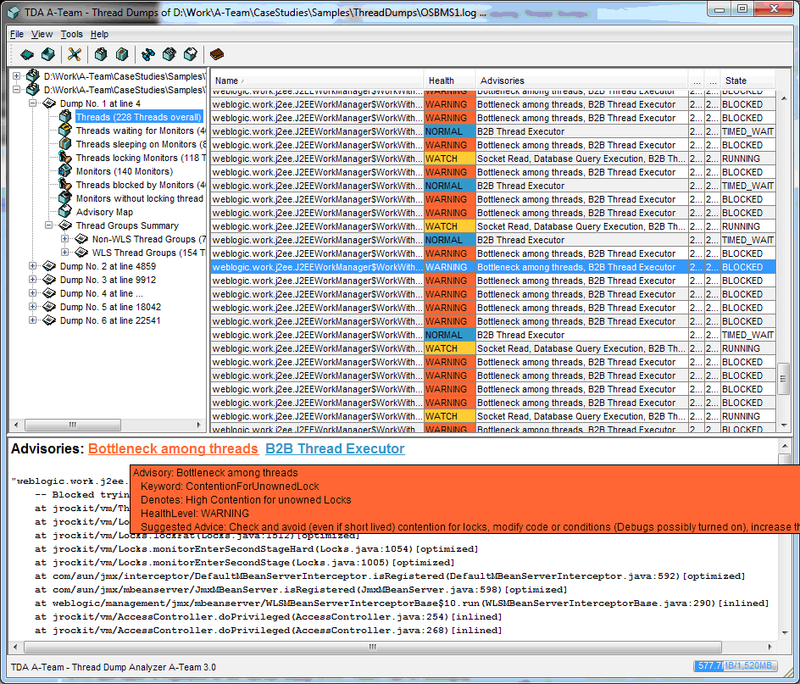 It was decided to take thread dumps to understand what the p13n cache is executing. Analyzing the product code against the stack trace, it appeared that there was a mismatch between the CacheManager.flushKeys() implementation as the method code lines didn’t match. So, it was apparent that there was some variant form of CacheManager that was getting picked by the application while handling the cluster announcements. Thread Dump Analysis is a really valuable and key weapon in every Java Developer and Architect’s arsenal when it comes to understanding, identifying and resolving performance or other issues. I hope this series (along with the new enhanced TDA tool) helps makes it easier and useful for people to troubleshoot, tune performance and get a better handle over complex Java/JEE systems. This section details with when, how to capture and analyze thread dumps with special focus on WebLogic Application Server related thread dumps. Subsequent sections will deal with more real-world samples and tools for automatic analysis of Thread Dumps. Everyone must have gone through periodic health checkups. As a starting point, Doctors always order for a blood test. Why this emphasis on blood test? Can’t they just go by the patient’s feedback or concerns? What is special about blood test? Identifying and start focusing on the problem areas with prevention and treatment. The Thread Dump is the equivalent of a blood test for a JVM. It is a state dump of the running JVM and all its parts that are executing at that moment in time. There might be 100s of components and layers but difficult to identify what is getting invoked the most and where to focus attention. A thread dump taken during load will highlight the most executed code paths. The cost associated with capturing thread dumps is close to near zero; Java Profilers and other tools can consume anywhere from 5 to 20% overhead while a thread dump is more of a snapshot of threads which requires no real heavy weight processing on part of the JVM. There can be some cost only if there are too many interrupts to the JVM within real short intervals (like dumps forever every second or so). There are various options to capture thread dumps. JVM vendor tools allow capture and gather of thread dumps. Operating System interrupt signals to the process can also be used in generating thread dumps. 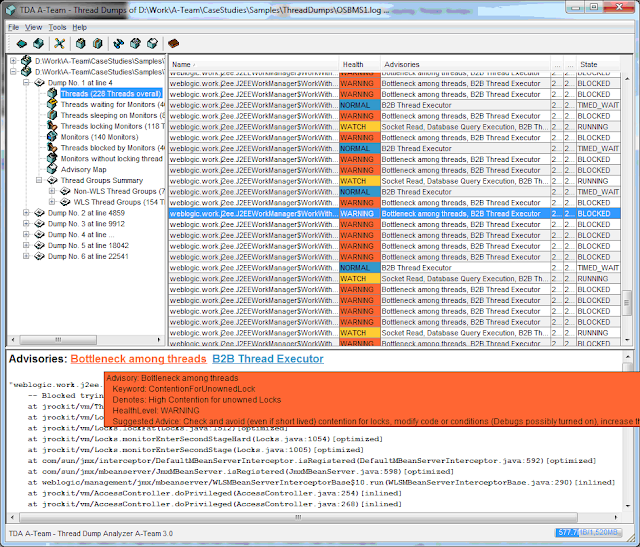 Sun Hotspot’s jstack tool (under JAVA_HOME or JRE Home/bin) can generate thread dumps given the jvm process id. Similarly, jrcmd (from JRockit Mission Control) can generate thread dumps given a jvm process id and using the print_threads command. Both require to be run on the same operating system as the jvm process and both dump the output to the user shell. In Unix, kill -3 <PID> or kill -SIGQUIT<PID> will generate thread dumps on the JVM process. But the output of the thread dump will go to the STDERR. Unless the STDERR was redirected to a log file, the thread dump cannot be saved when issued via kill signals. Ensure the process is always started and STDERR is redirected to a log (best practice to also have STDOUT redirected to same log file as STDERR). In Windows, Ctrl-Break to the JVM process running in foreground can generate thread dumps. The primary limitation is the process needs to be running in the shell. Process Explorer in windows can also help in generating thread dumps but its much more problematic to get all the thread stacks in one shot. One has to wade through each thread and gets its stack. Another thing to keep in mind is, JVM might ignore interrupts if they were started with -Xrs flag. WLS Admin Console can generate thread dumps. Go to the Server Instance -> Monitoring -> Threads -> Dump Threads option. 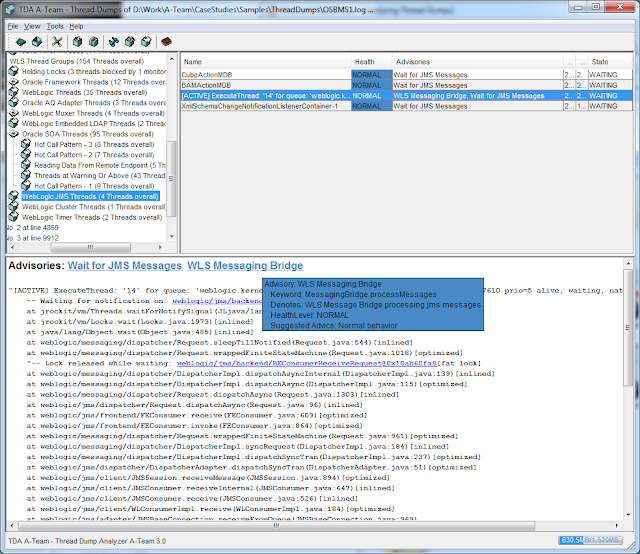 Using weblogic’s WLST (WebLogic Scripting Tool) to issue Thread dumps. A Thread Dump is a brief snapshot in textual format of threads within a Java Virtual Machine (JVM). This is equivalent to process dump in the native world. Data about each thread including the name of the thread, priority, thread group, state (running/blocked/waiting/parking) as well as the execution stack in form of thread stack trace is included in the thread dump. All threads – the Java VM threads (GC threads/scavengers/monitors/others) as well as application and server threads are all included in the dump. Newer versions of JVMs also report blocked thread chains (like ThreadA is locked for a resource held by ThreadB) as well as deadlocks (circular dependency among threads for locks). What are locks? Locks are regions that act as speed beakers or gatekeepers to ensure only one thread can obtain a temporary ownership of a resource and start work on something. This is mainly to ensure multiple threads don’t work in the same region and mess up the final outcome or to ensure ordering of execution. This can be equated to only one person can operate on an ATM machine at a time as you don’t want multiple different users to withdraw or deposit at the same time from the same machine without the ATM machine being able to confirm each of the operation being carried out (like credit multiple times a single deposit or credit to wrong accounts). Similar to Writer/Readers problem in OS scheduling, we don’t want the multiple writers to intersperse their writes to the same page or readers to read incomplete content. JVM provides implicit locks whenever a code demarcates a method call as synchronized or a region of code within a method. The lock can be on an instance or class level or method level. JDK 1.6 provides higher level abstractions in form of concurrent.locks package (Rentrant Locks) similar to the jvm locks.